Ernst Busch trained as a metalworker at the Germania shipyard in Kiel, where he took part in the 1918 mutiny. He worked as an actor from 1920 on, from 1926 in Berlin, including with Max Reinhardt and Bertolt Brecht. Busch made a name for himself as a singer of political songs, particularly at communist events. 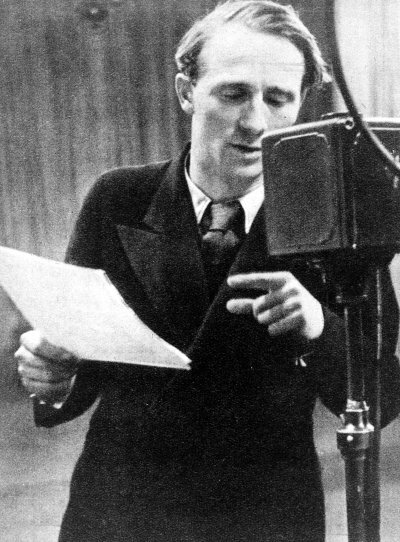 On March 9, 1933, Busch escaped Germany for the Netherlands, where he worked at Radio Hilversum. His exile took him to Belgium, France, and Switzerland; in 1935 he moved to Moscow, working for the Comintern radio station. From January 1937 to August 1938, he worked as an artist entertaining the International Brigades in Spain. In 1938 he took part in concerts held in Belgium to support volunteers in the Spanish civil war and Jewish refugees from Germany. Busch was arrested in Antwerp on May 10, 1940 and deported to France, where he was interned in the St. Cyprien and Gurs camps. During an attempt to escape to Switzerland in January 1943, he was arrested by the Vichy regime police force and handed over to the Gestapo. While imprisoned in Berlin, Busch was severely injured in an air raid, which paralyzed the left half of his face. He was sentenced by the Berlin High Court to only three years in a penitentiary on March 15, 1944, as the evidence in the case had been destroyed by the air raid. Ernst Busch was liberated from Brandenburg-Görden penitentiary on April 27, 1945. He remained one of the GDR’s most popular singers and actors up to his death in 1980.